Calcite is a very common sedimentary mineral. It is a carbonate with the chemical formula CaCO3 calcium carbonate. It is a part of limestone and marble. Many marine animals use this mineral to construct their shells. Foraminiferons, bryozoans, brachiopods, and oysters all use calcium carbonate to make their shells. It is soft a 3 on the Mohs scale. It can be easily scratched by a penny but not by a fingernail. It can be almost any color. Clear, white, yellow, and brown are all common colors for this mineral but greens, blues, reds, and even blacks can happen. Impurities like iron or magnesium can add color. Calcium carbonate can dissolves in water under the right conditions and so is carried along with water into cracks, fissures, and caves. It can over time build up layer upon layer to form stalactites and stalagmites in caves. In a less spectacular way it is carried into small hollow places slowly filling in the empty spots to form crystals inside of geodes. As stated above calcite can slowly build up over time adding material to the rock record. Given the proper conditions it can also be removed from the rock record. Because water is slightly acidic it can dissolve calcium carbonate hollowing out rocks, forming caves and caverns. This is common in areas with thick and extensive limestone deposits. Carlsbad Caverns is a famous example of this process. As this process continues the roof of the cavern collapses creating a sink hole. Sedimentary rocks like sandstone are often glued together with these same calcium carbonate minerals. These materials can be unglued when slightly acidic water dissolves the bonds holding the sediments together. There are many crystalline habits for this mineral including rhombohedra, tabular forms, and prisms. 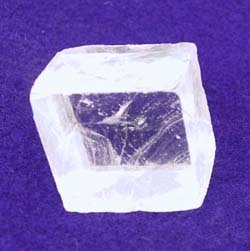 Clear calcite crystals are possible. Called optical calcite these crystals have an interesting characteristic called double refraction. They make images appear to be doubled.